190 Magic Autographs with Chrome Refractor Parallels numbered to 10. 15 different Dual Magic Autographs numbered to 25 with Chrome Refractor Parallels numbered to 5. 10 different Triple Magic Autographs numbered to 25 with Chrome Refractor Parallels numbered to 5. New Gridiron Stamp of Approval: Each of these 50 stars are displayed along with an actual football themed U.S. Postage stamp, embedded into a mini card, and numbered to 10. New Historical Stamp of Approval: 50 American greats paired with a corresponding, authentic U.S. Postage stamp, also embedded into a mini card, and numbered to 25. New Magic Relics: 60 players from base set with jersey swatch numbered to 25. Rookie Stars Insert Set: 20 outstanding 2010 NFL Rookies including Dez Bryant, Tim Tebow, Sam Bradford, and more. Magical Moments Insert Set: Top 20 moments and personalities from the 2010 NFL Season. History's Best Insert Set: The game's biggest stars past and present. 250 Pigskin Mini Parallels numbered to 50 (NEW)! 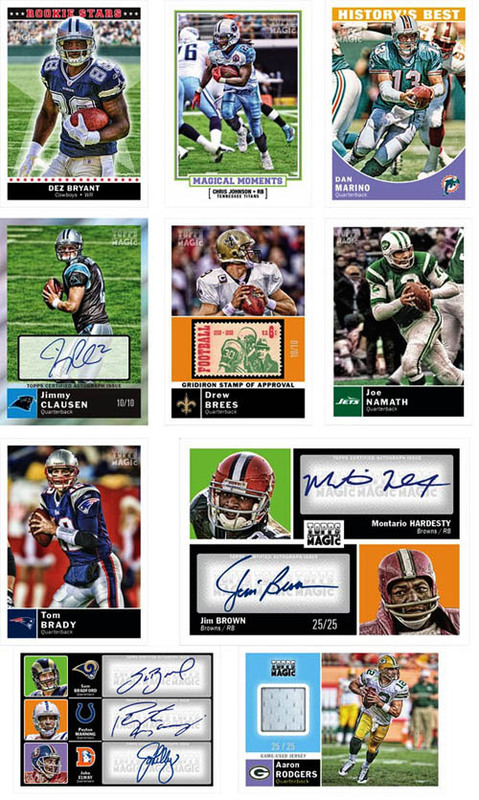 Topps Magic is back for another season of vintage gridiron action. The 2010 rendition will feature NFL logos rather than 2009's NCAA logos and theme. If 2010 Magic is anything like last years, it will be one of the years best products.